Description of Venue: European settlement in the town of Raglan, like many in central Victoria, occurred due to the discovery of gold in the 1850s, and there still exists today numerous mining relics scattered around in various privately owned paddocks. There are also still many buildings standing in the area dating from the late 19th and the early 20th century, of which Raglan Hall is one. Today the main industry of Raglan is sheep grazing. The hall is sited in a rural landscape with splendid views of Mount Cole, and within close access to a recreation reserve within close proximity to toilets, water and a tennis court. 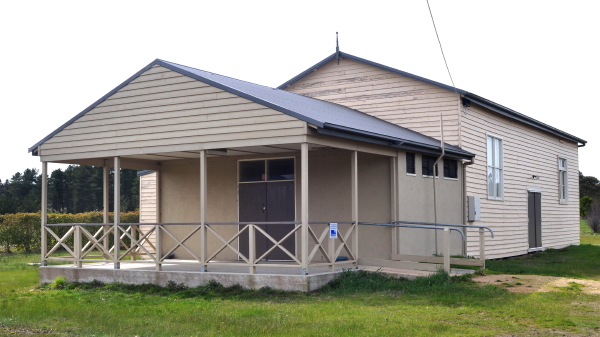 Regular events held at the hall include community fundraisers, shire ceremonies, community dances, family meal nights (eg xmas in July) and training facilities (eg CFA). The hall is also suitable for private functions such as weddings, birthday parties, funerals and exhibitions. 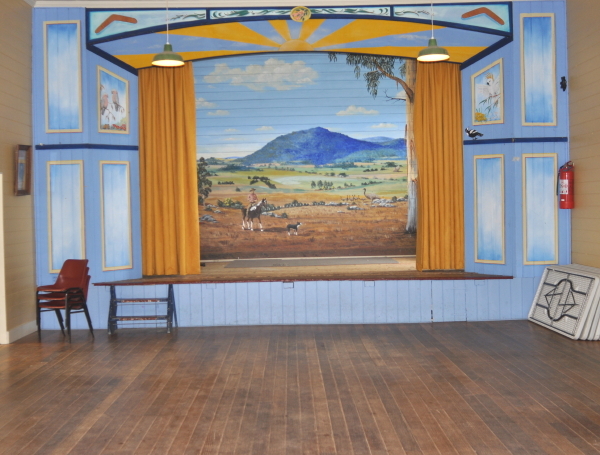 The stage features an amazing mural painted in 1994 to reflect local activities at the time such as endurance riding, hang gliding, agriculture and local wildlife. The mural depicts the view you would have from the front entrance of the hall looking out over the landscape toward Mount Cole. There is even a piano on site for old fashioned singalongs. The kitchen has ample bench space for the preparation of food, and features and large serving window. 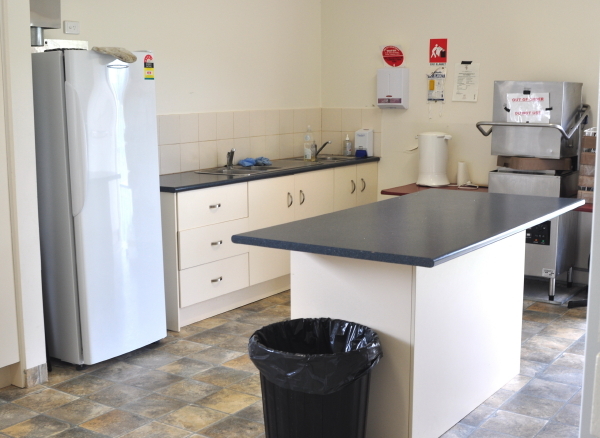 Facilities include a dishwasher, bain marie, fridge, double sink, commercial oven/stove, microwave, cutlery , urns and crockery. A portable gas bbq is available for outdoor functions. 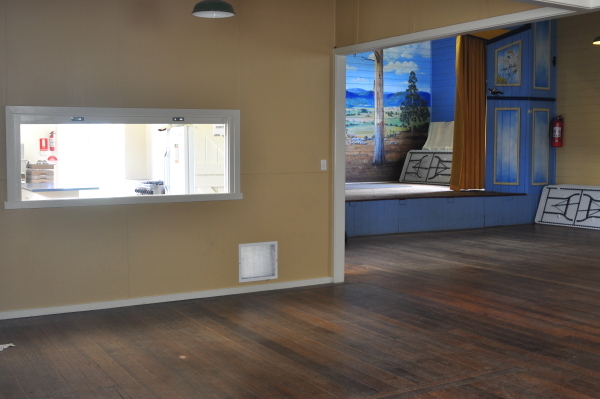 The hall is heated and cooled with reverse cycle air conditioning, and ample off road parking is available. More information is available upon booking. 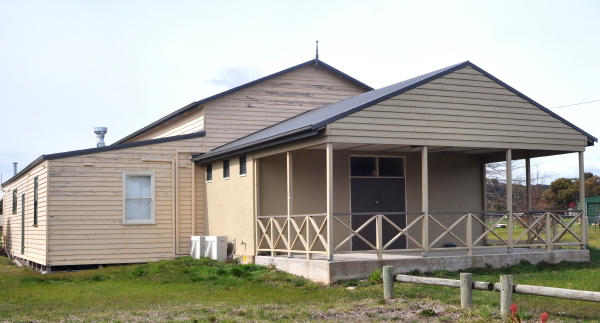 Types of events which are run/held: Events held at the hall include community fundraisers, shire ceremonies, community dances, family meal nights (eg xmas in July) and training facilities (eg CFA). The hall is also suitable for private functions such as weddings, birthday parties, funerals and exhibitions. Kitchen: The kitchen has ample bench space for the preparation of food, and features and large serving window. Facilities include a dishwasher, bain marie, fridge, double sink, commercial oven/stove, microwave, cutlery , crockery and urns. Stage: The stage area is 3.7 x 7 mteres, and features basic lighting. There is a back entrance to the stage for performers, but no stairs leading to the door from outside the hall.